Enjoy a fine cheese fondue outside. 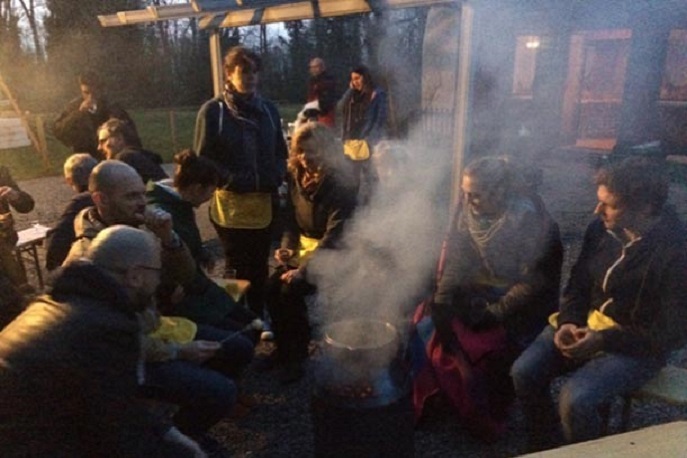 At dusk and at night, the milk churning fondue becomes a cozy outdoor event at the location of your choice throughout Switzerland. Savour a mouth-watering cheese fondue outdoors in the forest. A winter highlight for clubs, companies, birthday celebrations. 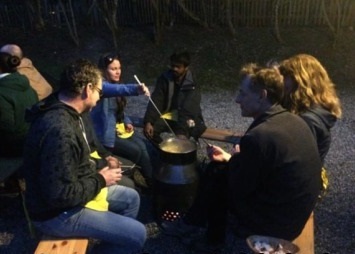 At dusk and when it’s dark, our milk-churn fondue offers a unique, romantic outdoor experience at a location of your choice anywhere in Switzerland. Some fantastic site suggestions include beside a house in the woods, on a farm, in a garden or on your company’s grounds – wherever you choose, we come to you with our milk-churn fondue! The fire in the milk churn melts the cheese and warms the fondue without any smoke to disturb you whilst eating in the setting of your choice. 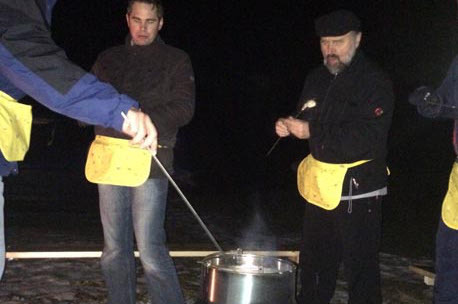 Enjoy lots of fun with a Farm Olympics, a ‘Swissness’ Day, a snowshoe touror an archery contest by torchlight and afterwards, to add the perfect finish, savour an unforgettable outdoor fondue out of the milk churn! We supply everything: Milk churns and extra long forks so nobody’s fingers get burned and a special fondue apron in which you can keep your bread and wine glass and have your hands free. Should any of the participants have a cheese allergy, we can supply alternative foods.